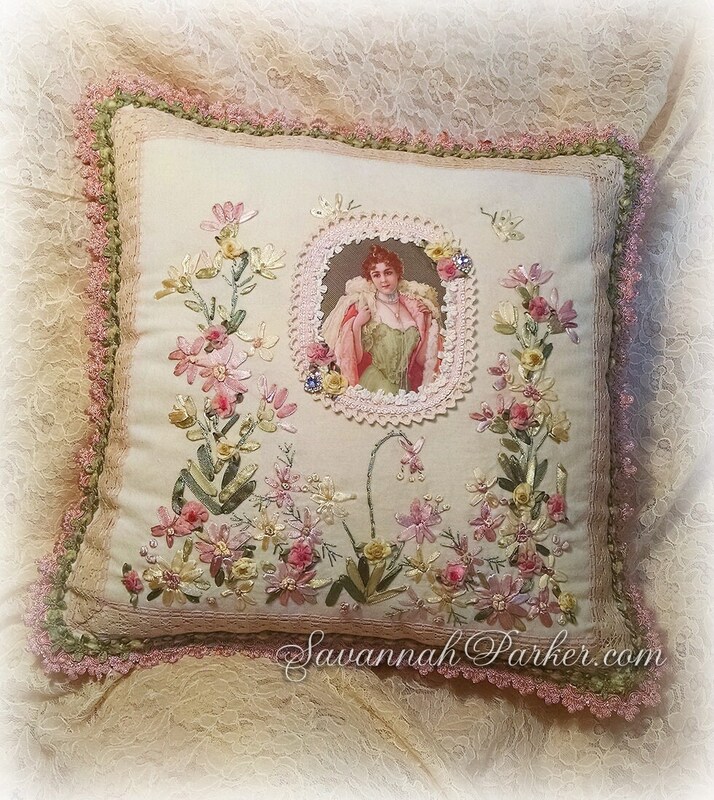 Antique Style Victorian Edwardian Romantic Pink and Green Lady exquisite embroidered handmade pillow.....part of my very popular line of fabulous antique-inspired, totally romantic shabby chic/cottage chic and Victorian style pillows....This ONE OF A KIND creation is lavished with antique lace and trim & sparkling little jewels as well as tons of gorgeous ribbonwork embroidery and handmade flowers.... For many years I've looked at many of the "shabby chic" type pillows made from vintage materials, but never cared for the "shabby" part; am just not into the frayed and tattered look....! 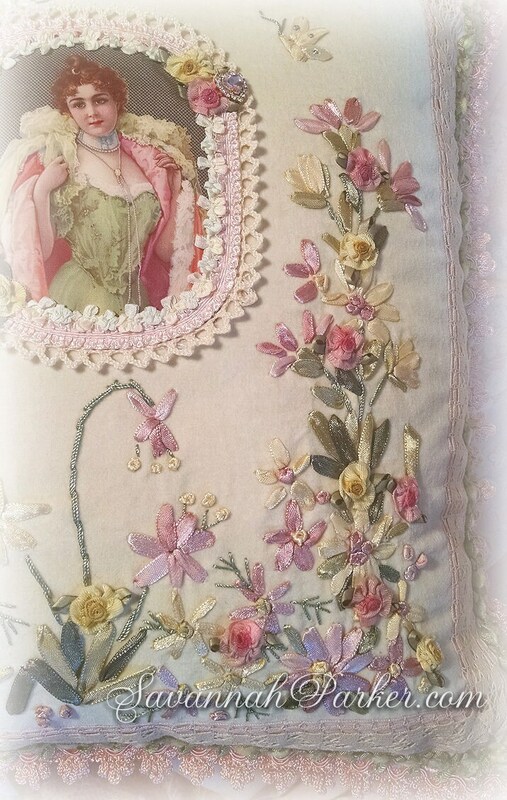 So I decided to design my own very antique-inspired pieces that incorporate some of the exquisite laces, trims & materials in my never ending stash, with more elegant & clean details....you won't find any raw edges or haphazardly tacked-on doilies here, only the fabulous vintage elements and fine-couture quality finishing that is the standard for all my creations....This one has a truly exquisite, printed-on-fabric portrait of a gorgeous Victorian lady in pink and green evening dress as a focal point---surrounded by the most sumptuous hand done ribbonwork embroidery on ivory velvet! 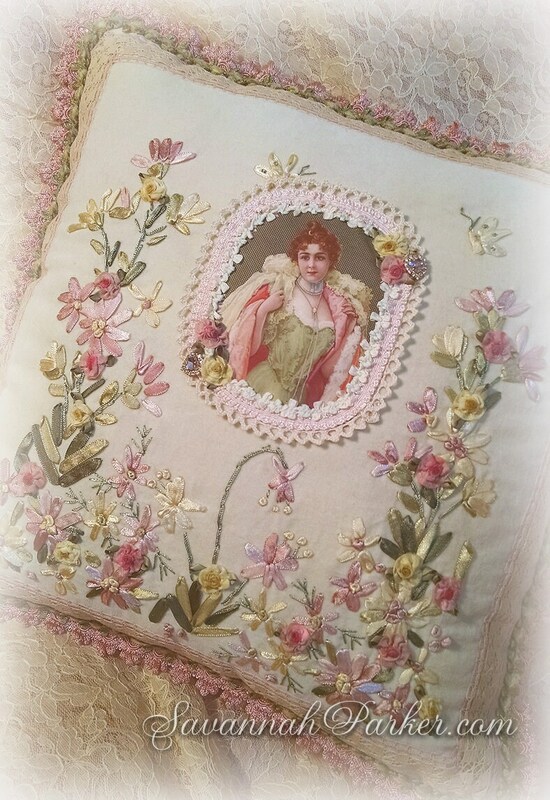 A beautiful, big pillow that will be the focal point of a wonderful antique style room/bedroom/boudoir...the perfect accent for a lavish bed or an elegant sofa/chair or chaise. 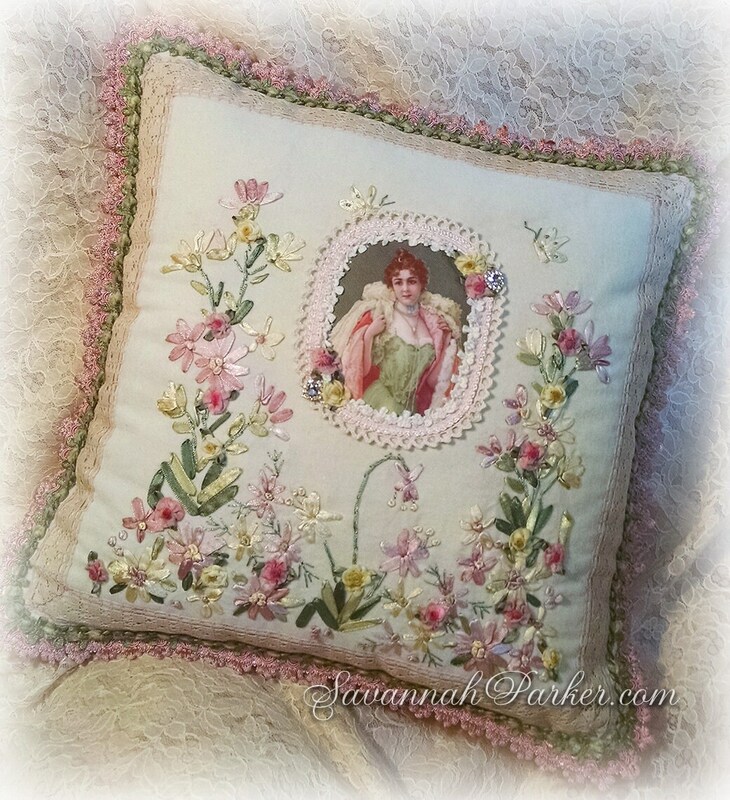 NOTE: This is a one of a kind, READY MADE and READY TO SHIP pillow! 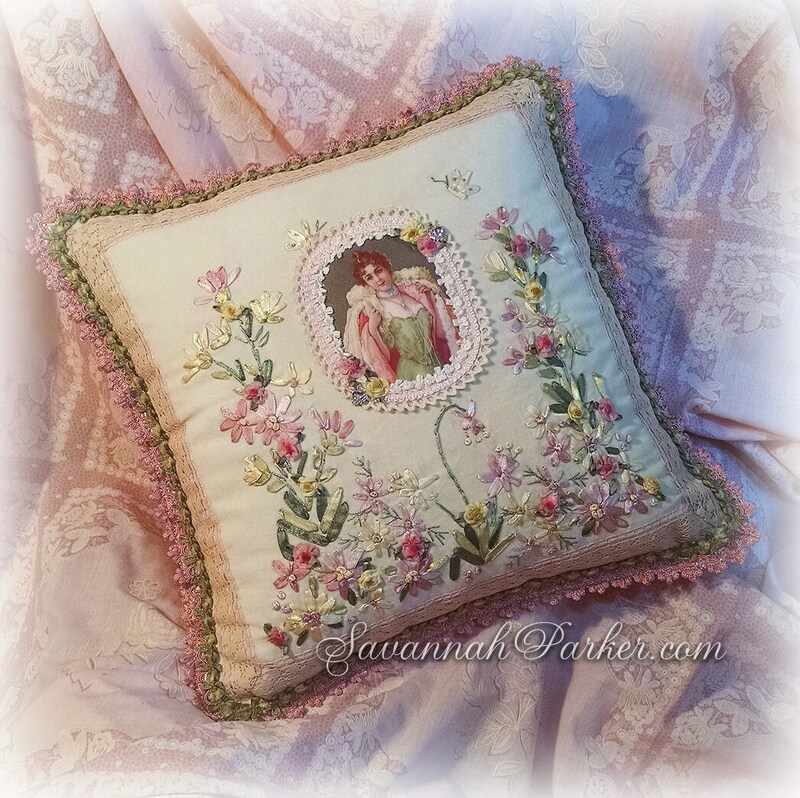 PLEASE BE SURE to read ALL of the description especially the measurements, before asking any questions---and do be absolutely positive this piece will match your requirements, as there are no refunds or returns. 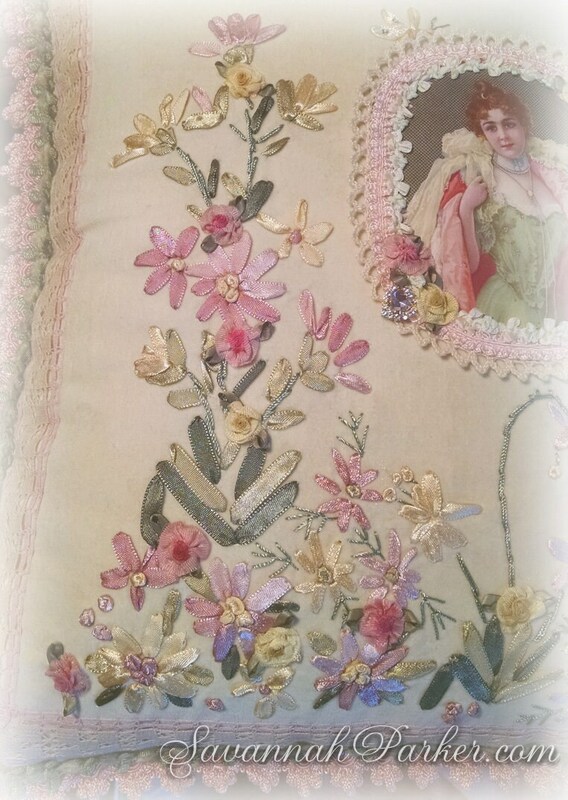 This incredible piece was inspired by my love of antique Victorian, Edwardian and 1920's fashions and decor...This exquisite totally handmade pillow is a nice larger size to accommodate all the fantastic embroidery and detail...the entire front is exquisite soft ivory cotton velveteen that is lavishly hand embroidered with tons of hand done ribbonwork roses, leaves and flowers in a garden full of various types and sizes of ribbon-embroidered flowers and leaves in shades of pink, rose, greens and pale yellows .....accented further with little hand sewn deep pink and yellow handmade ribbon flowers dotted here and there throughout....all of the elements here are entirely hand sewn/hand embroidered! 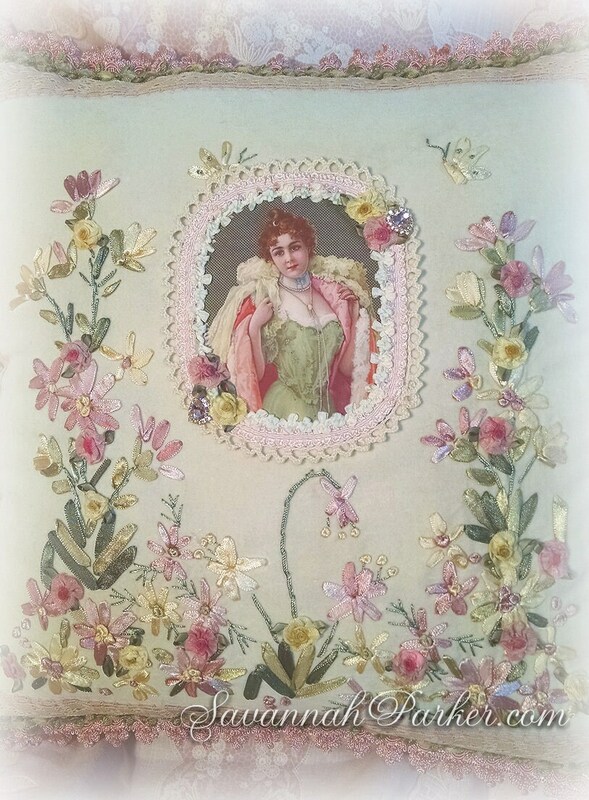 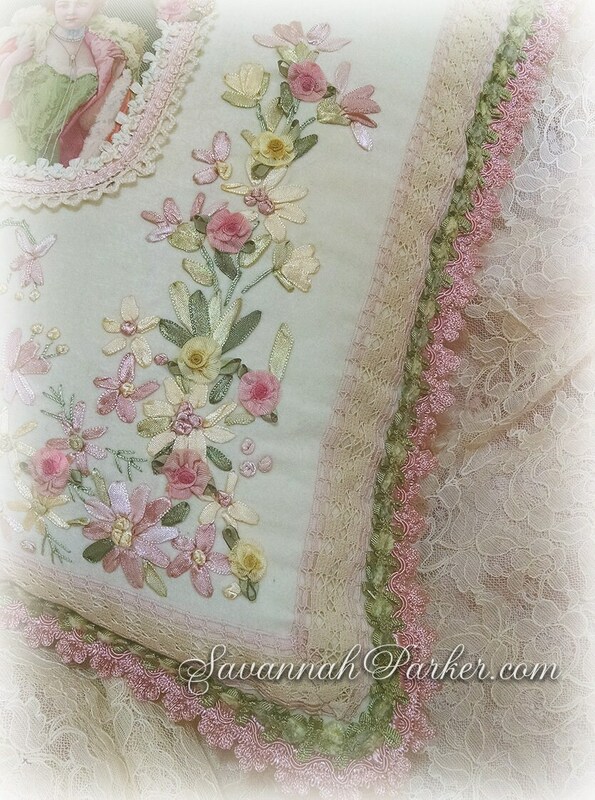 Above this myriad of luscious ribbonwork flowers is a gorgeous vintage-style print on fine cotton of a beautiful Victorian lady in a green evening gown and a ruffled pink and rose evening wrap....she is surrounded by carefully hand sewn ruffles of antique lace, antique pink silk ruffled trim and dainty pure silk pale yellow and green rococo trim, touched with more of the rose and yellow handmade ribbon roses and two little sparkling pink heart glass jewels set in filigree brass....The pillow front is bordered by handsewn delicate antique two-tone lace in ecru and pink, chenille and ribbonwork trim in green, and rose pink scalloped gimp trim. 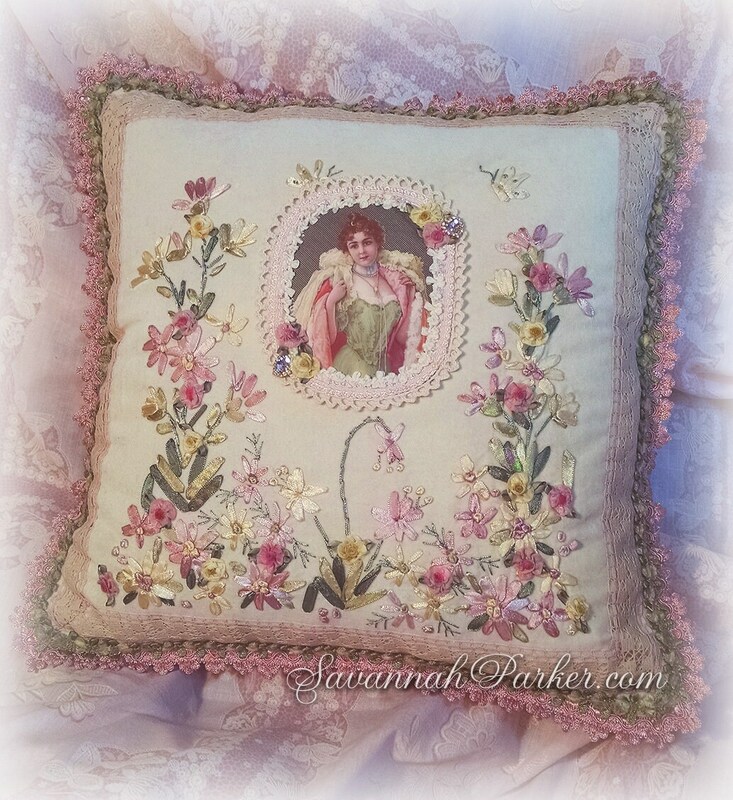 The back of the pillow is also ivory velvet and features a full zipper opening, and it is firmly filled with a high quality, separate pillow form. 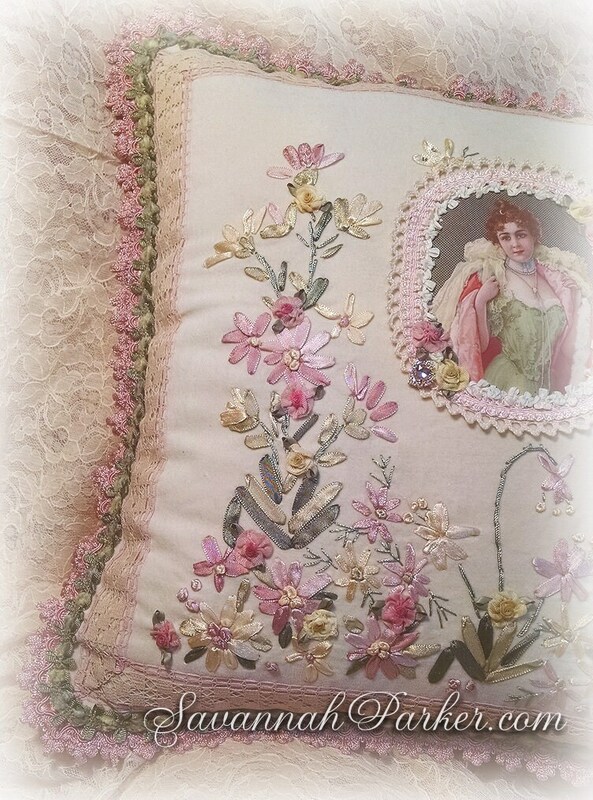 All elements of this pillow are very meticulously sewn; NO gluing whatsoever....all of the lace, embroidery and added elements are HAND SEWN on to the pillow front, not done by machine--strictly old-school craftsmanship.